Happy Wednesday! 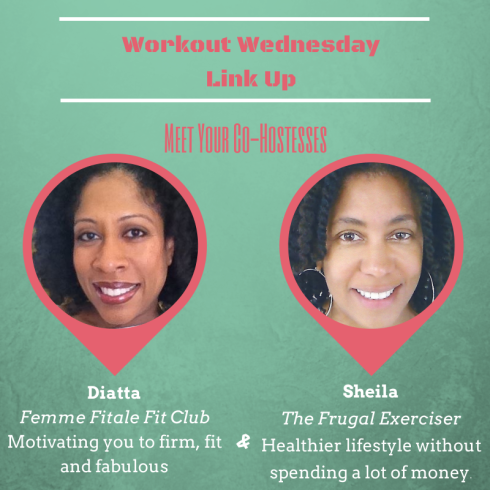 Today's my first time hosting the Workout Wednesday (WOW) linkup, with fabulous co-hostesses Diatta Harris from Femme Fitale Fit Club, Sheila Simmons The Frugal Exerciser, and brand new co-hostesses Natalie from Clean Eating Teen, Jenn from Comeback Momma, and yours truly! I've been focused on my first 10-mile race this Saturday, but I wanted to kick off my Workout Wednesday co-hosting duties with a very special guest post. My friend and former co-worker, Lauren, is preparing for a much bigger race this week, and is here to share her story. "Hi! I am a former cubicle-mate of Amanda's who has kindly invited me to guest post about my experience training for the Boston Marathon on April 21st! Since we worked together in Washington, DC, Amanda and I have gone separate ways - her to lovely Santa Barbara, and me to Boston for graduate school. 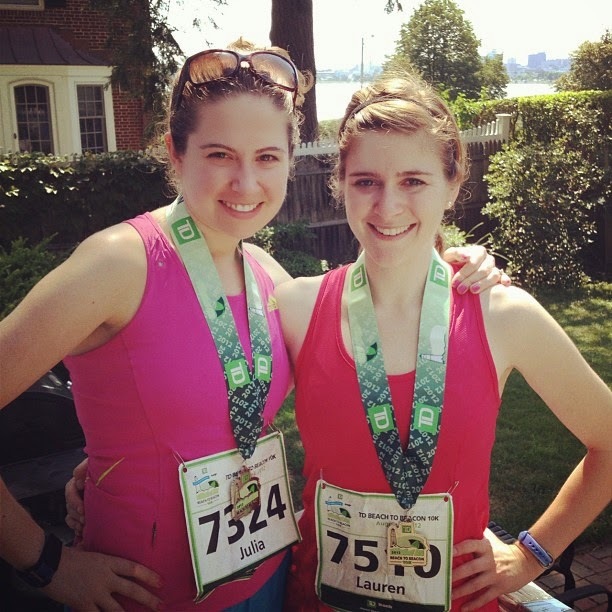 I've been a casual runner for years, ever since a friend convinced me to do the Cherry Blossom 10-miler, but never ever considered a marathon, even after doing two half marathons in the past year. However, my university, Tufts, has a relationship with the Boston Athletic Association that reserves 100 bibs for students, faculty, staff, and alums, with a requirement that students raise $1,500 for nutrition and obesity research at Tufts Friedman School of Nutrition Science and Policy. This is pretty cool, because the Boston Marathon is notoriously difficult to qualify for, and running as a charity entrant can require raising several thousand of dollars. So, with the encouragement of my sister, who ran the Marine Corps Marathon a few years ago, and peer pressure from some friends, I signed up. So, in January, my training began in earnest as I contemplated running more miles (in training!) than I had ever run before. We are lucky to have an awesome coach for the team, and the camaraderie of having built in teammates. We also had several scheduled runs on the marathon course, and team runs twice a week. It makes it much easier to wake up for a 7 AM run in January when it's 5 degrees in January when you know that there's a whole group of people waiting for you! There have definitely been challenges - the polar vortex, a stubborn IT-band problem, trying Gu for the first time - but overall it has been an incredible experience to realize I can run further than I ever thought. I can't believe the race is so soon, and I am sure it will be emotional given last year's bombings. I am looking forward to crossing that finish line!" I'm so proud of Lauren and inspired by her decision to seize the opportunity to run the Boston Marathon in such an emotional year, even though it was something she'd planned on doing. I hope everyone will join me in wishing her luck on her first marathon! If you want to follow Lauren's progress during the race, read these instructions to track her bib number, 30620. Lauren's a rock star and has exceeded her fundraising goal, but if you're interested in supporting nutrition and obesity research at Tufts you can donate here. Now that we've had that dose of inspiration, let’s get on to the party! 2. Don’t be a wallflower. Show some comment love and support to other party goers of this link up by visiting their blogs and either leave a comment on a post, subscribe or both! Visit at least 5 others who have joined the party. 3. Invite your like-minded friends! We love finding and reading new blogs so spread the word so we can increase the size of our parties every week. 4. Use hashtag #wowlinkup when you comment on someone’s post for easy identification. 5. Last but definitely not least, HAVE FUN! This IS a party. Disclosure: Your link will display on Femme Fitale Fit Club, The Frugal Exerciser, Eat Hard Work Hard, Clean Eating Teen, and Comeback Momma blogs. Ok I have been making excuses about why I can't train for a marathon for years. But if she could train through the polar vortex I think my excuses are void! Yea she's pretty amazing! No way I run outside when it's below freezing lol. Thanks for stopping by! Best of luck Lauren! What an amazing opportunity! Thanks so much for the good wishes! I know Lauren will appreciate them! Thanks for the good wishes and for stopping by Lena! Eeps! Good luck with your race this weekend! BOTH of your races! Good luck to both you and Lauren!! I will def have to check out your Wednesday linkups! Thanks Jenny! You should definitely join in! Good luck to both you and Lauren!! I will definitely have to check back to see how things went. How did it go? I'm late to linking up (#wowlinkup) this week but I made it. Is Lauren getting a phd in nutrition? Thanks for stopping by Sheila! 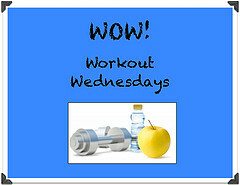 The race went really well, I have a recap up for this week's WOW linkup! Lauren's getting her MA in International Affairs.